Our guest blogger today is author Pat Mora, whose book “Yum! Mmmm! 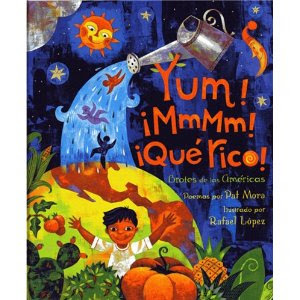 Que Rico!”, from Lee & Low Books, is part of First Book’s Stories For All Project. “Once upon a time . . .” A magic phrase that can change our breathing. As far as we know, humans are the world’s story-telling creatures. Let’s think about the unique period in the lives of children when they begin to savor that phrase, when in fresh ways little ones are experiencing their surroundings and deciding where they fit. For many youngsters, media is their main source of information and entertainment. Children lucky enough to become readers discover that they can read those once-upon-a-time words to themselves—and others. They discover the pleasure and power of words. Since words and books are powerful, how can we doubt that the images of children, families, and cultures in their books have a subtle and significant impact on young readers and their families? Who merits having their stories shared and who doesn’t? How does it feel not to see people like you between the covers of beautiful books? Are all our books created and valued equally? I wish you could see the smiles of Spanish-speaking children when, in reading one of my books to them, I say a word in Spanish. “Leaves sail through the air/like lazy mariposas,” I say, and the bilingual children smile as they imagine lazy butterflies. Those children delight in sharing their linguistic knowledge. They feel included, a feeling we all appreciate. Makes me wish I were trilingual, multilingual. Luckily, in our diverse country, we have authors and illustrators from many countries excited by sharing their stories. Diversity: our common wealth. Once upon a time in El Paso, Texas, I grew up in a house with books. I assumed everyone did. Years later, as a new children’s book author, I realized that many homes, apartments, and trailers in this country had no books. Not one. I felt (and feel) a quiet sadness. These children are growing up without the magic found on the page: the stories, facts, adventures, poems; the words that take readers on journeys physical and emotional, that make us feel less lonely, part of the human family. I’m grateful to publishers such as Lee & Low that have consistently published books that belong in our libraries, schools, and homes. Readers, and we are a large and powerful group, need to be enthusiastic and self-interested purchasers of multicultural books. Why self-interested? Because we want to savor our rich and complex literary tradition, and we want this same experience for our country’s children.